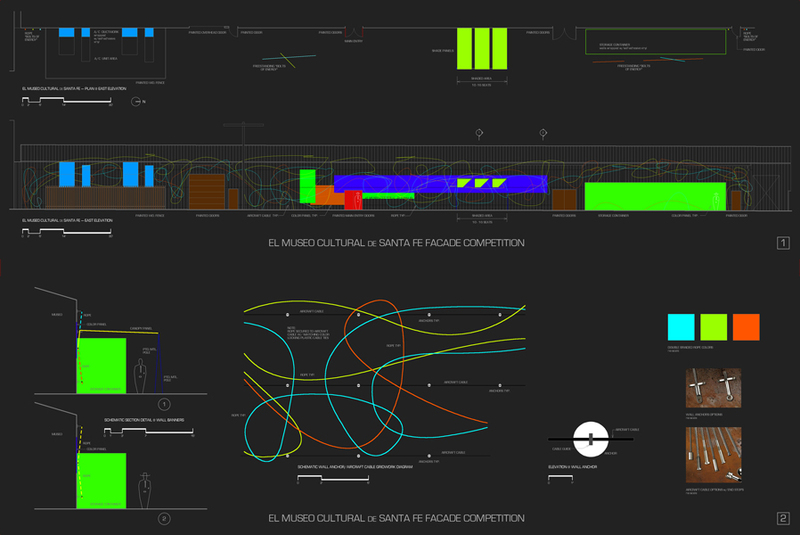 The proposed art installation for the façade of El Museo Cultural de Santa Fe draws inspiration from the rich heritage and flavor of the New Mexican southwest, while utilizing a contemporary, modernist design vocabulary. The design is both universal and site-specific in nature. Through a strong sense of movement, vibrancy and color, the design pays homage to summer, art and cultural diversity, while imparting an overall sense of levity, sympathetic to the simple no-nonsense structure. The bold scale of the design is commensurate with a structure nearly 250' in length. The design "skin" consisting mainly of rope, articulated as "bolts of energy", celebrates the joy of art and vibrancy of southwest culture. Bold colors and a kinetic layout (an intermix of flowing curves interrupted by occasional kinks) accentuate the sense of movement and charged quality of the installation, while engaging and transforming the entire façade. The shadow play of the rope on the façade as the sun travels a daily arc through the sky will create ever-changing patterns.